With the new 8.7 release of the MailUp email marketing software platform new list building functionality was added, including a drag and drop form builder. The new List building tools tab replaces the previous Subscription forms tab and it is a redesigned section with a new drag and drop form builder, along with a subscribe button tool, and email sign-up pop-up integration with PadiAct. All displayed in the subscription forms view below. 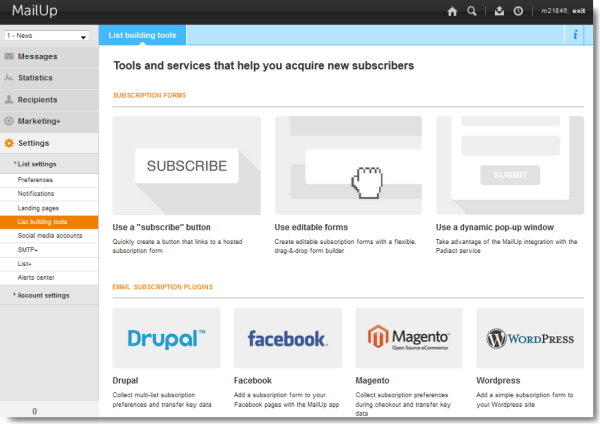 Also plugins for Drupal, Magento, and WordPress will help marketers to retrieve new subscribers from those applications. A new Facebook app is on the roadmap. The new email subscription form builder allows marketers to create their your own custom sign-up forms in simple drag-and-drop fashion without the need for any HTML knowledge. Form elements like custom fields, drop-down menus, radio buttons, check boxes, etc. can be picked and drop them into the canvas. Below is a screenshot of how the email block drag-&-dropped into place. After completion, marketers can either paste the HTML code of the form back into a webpage on their own website or use a MailUp hosted version and link to it. Sign-up to multiple mailing lists. A marketer can build its sign-up form to include subscription to multiple mailing lists. Each label represents a list in their email marketing software. Map custom fields easily. 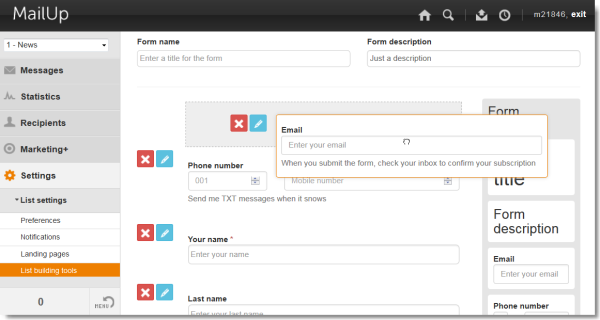 The form builder maps the correct recipient field IDs to form elements for you. Select from a drop-down which custom field in you want to save that information to. Mobile-ready and responsive sign-up forms. All forms designed by the Form builder use HTML5 markup. The hosted version will also include custom CSS to make the form responsive (i.e. ready for mobile devices). The new subscribe button tool is best used for when you’re looking for a simple sign-up button to insert in your website. This can be done in three steps: A marketer designs the button, links it to a form built with the form builder and gets the HTML code. This can then be can published on any Web page. In the new release several updates were made, including improved Activity filters which allow for segmenting subscribers based on their recent email activity (e.g. opened an email). Activity filters are also the basis for setting up drip campaigns and sending triggered emails. In MailUp 8.7the new setting: “exactly X day(s) ago” is introduced.